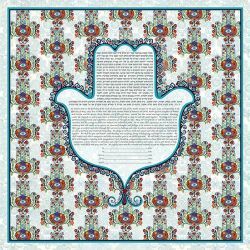 The symbolism in the �In Safe Hands� hamsa ketubah is perfect for a couple uniting their lives together in marriage. In Jewish mysticism, the hamsa is an amulet that offers protection from evil and brings blessings. The fish are a symbol of good luck too! May your union be filled with happiness and may your In Safe Hands Ketubah become a welcomed source of joy, illuminating your home for years to come.